When buying a hammock stand, there are many things to consider. How you choose to hang your hammock and where you decide to hang it will be the difference between sitting outdoors and relaxing. Choosing the best hammock for your yard is only one piece of the puzzle. The other is ensuring you have a high-quality stand that will last you for years. The perfect stand allows you to sit outside relaxed knowing that you will not fall. This is the best hammock stand on the market currently. The hammock stand comes packed with its fabric, and luckily you are not limited but have a choice of three fabrics to choose from; the Sunbrella fabric, Cotton fabric to Polyester fabric depending on your taste. However, every fabric has its comfort to ensure the hammock serves you right and you get value for money. For the comfort and a hammock that will give you years of service, then, the cotton fabric is the best deal. It will give you super comfort with a sensation that will take you away especially if you take it indoors when not in use. This colorfully vegetable stripped fabric offers long service and will not easily fade especially if you wash it without detergents, which may bleach the colors. Another fabric choice is the sunbrella. Just like the name, this material, will outlast every season and bring comfort just as the cotton fabric. It is stain resistant therefore cleaning is just hand wash, and you get years and years of service. The other fabric is the polyester fabric. This soft and durable fabric is highly fade resistant. In and out of season, you will enjoy resting on it year after year. The soft fabric makes cleaning easy too. You don’t need any tools to get the hammock stand assembled. Assembling even with limited manpower is easy. The hammock stands are made of steel that is sturdy and rust resistant. Whichever spot you want to place your hammock, the stands will support. Whether indoor or outdoor. If you are going to camping and you want to use your hammock stand, then you don’t have to be worried about how it will get there. The hammock carrying case makes it easy to transport your hammock to your destination of choice. 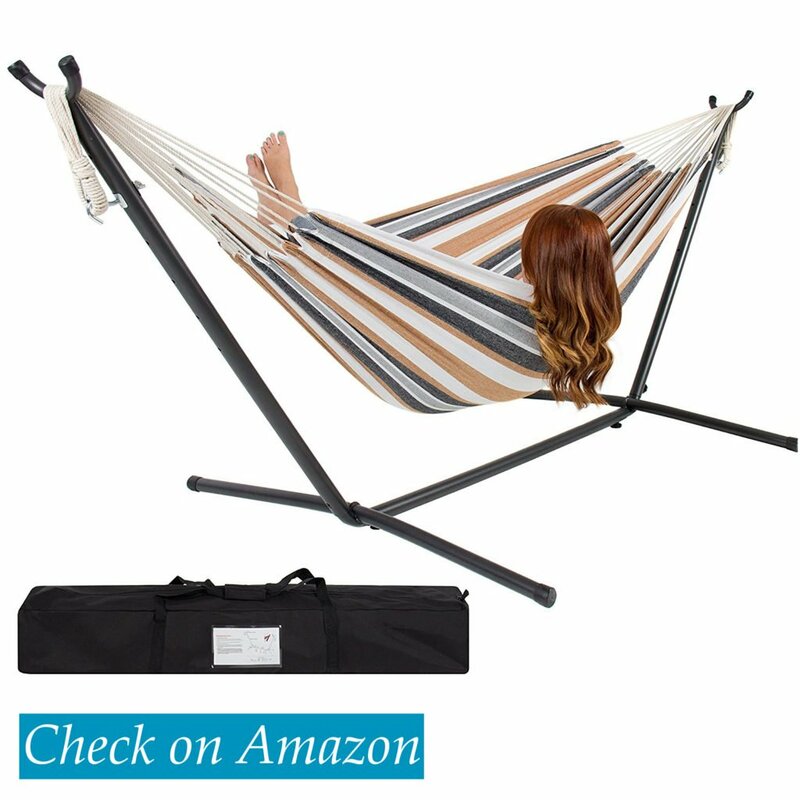 This is another great hammock stand with carrying case for easy portability and a space-saving stand. When it comes to a hammock, the fabric is very essential. You need something that is durable and able to hold on your weight with your partner as you rest, or else you will hit your butts on the ground. However, with 100 percent cotton, you are sure that it can hold you firmly and last longer. 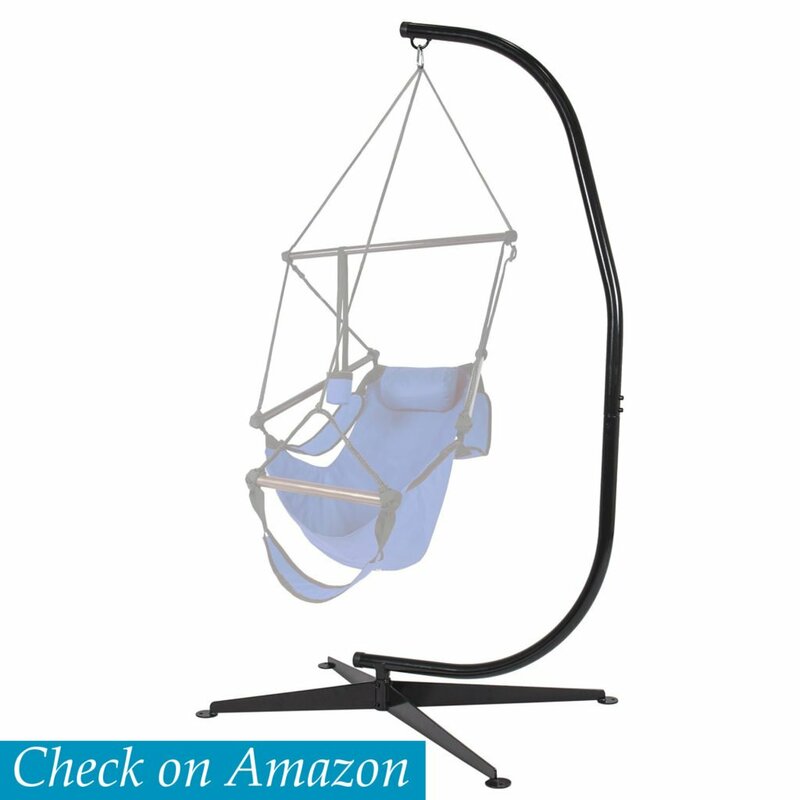 This hammock stand from best choice products is designed to ensure it can accommodate two adults. Therefore, the hammock stands are made of sturdy steel with a coating that makes it rust resistant and suitable for all weather conditions. It holds a weight capacity of 450lbs. It is also easy to install. Just as the name, this is one of the best hammock chairs stands you will ever find on the market and give you comfort and luxury while chilling either indoor or outdoor. Best Choice products are designed by skilled, talented and professionals to ensure that what you want is what you get. The company is dedicated to ensuring that the value of your money counts and speakers for you. With nearly a 360 rotation on your hammock chair, the luxury will just be pacing up. With high rating on Amazon and hundreds of customer reviews showing satisfaction on the item, there is always room for you to view life from the other side of view. The material used is of high quality. The tubes are made of steel coating to ensure that it is rust free and endures all types of weather. It’s also of the heaviest gauge, which ensures that it holds a capacity weight of about 300lbs. It’s 7 foot tall for better rotation angles. 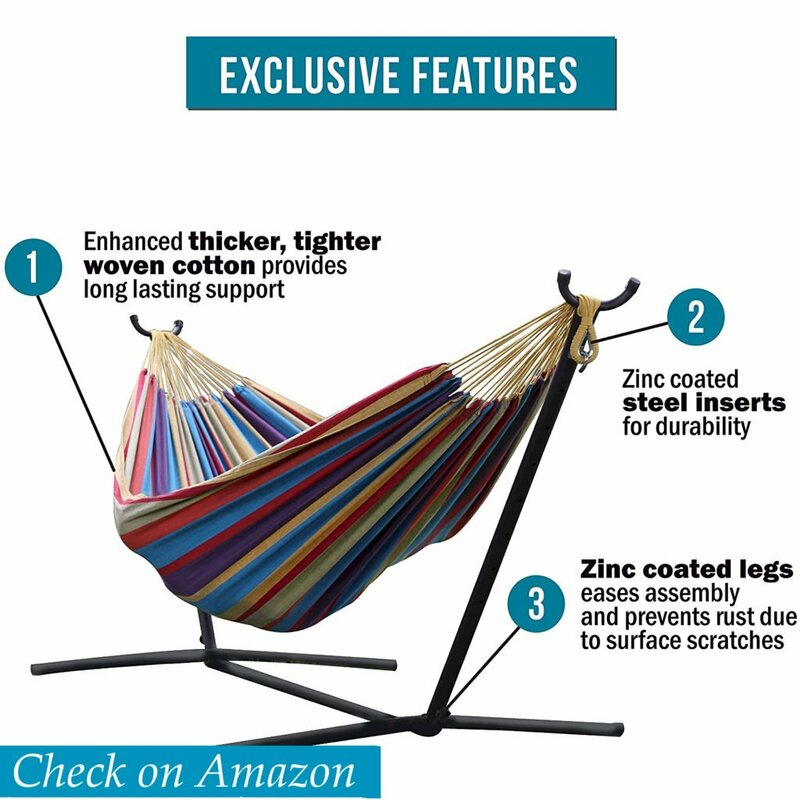 This hammock is compatible with all types of hammock chairs. Therefore, whatever brand you have, you can still improve the comfort by replacing the stand with this. You don’t have to concentrate on trees and other natural stands for you to get your hammock chair on use. The fact that it does not take a lot of living room space is a bonus for you. This is yet another sturdy product from the Sunnydaze décor. With great customer ratings on Amazon, you are sure that investing this direction will add value to your money. You have a chance to enjoy and make the most of all the days you feel lazy and can’t do anything at all. 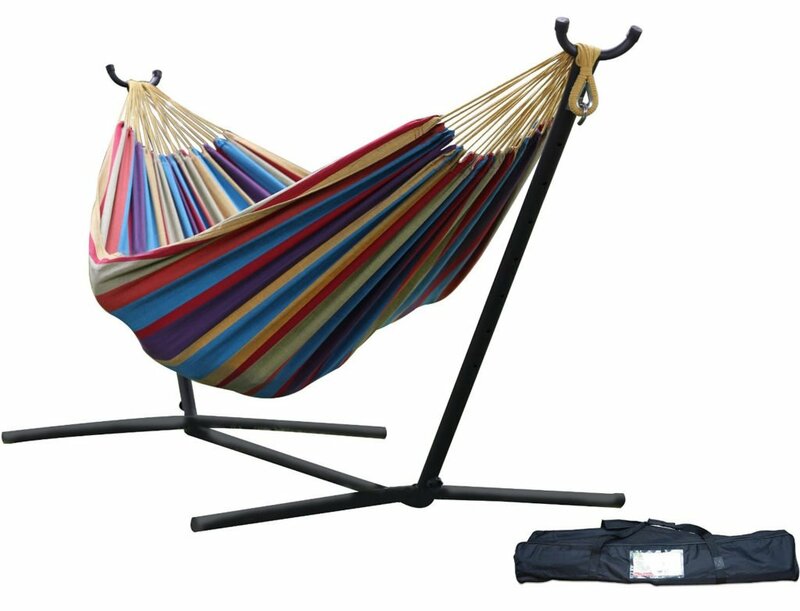 This hammock will redecorate your backyard, grace your camping experience or even spices outing and picnic experiences. It has the ability to hold a weight capacity of up to 275lbs, which makes it ideal for two. It comes with a pillow and has a neutral earth color. The fabric used in designing this pad hammock is acrylic with inner poly quilting, which ensures that it withstands all weather conditions. It’s ideal for use at any place any time with no weather limitations. Therefore, it will provide you with long-term service. The stand is made with steel coating that makes it rust resistant. Whatever size you are, you will fit well on this hammock. The measurement of both the hammock and stand is 52x144x45 inches, while the Hammock bed measures 52×76 inches. This is a guarantee that you will fit perfectly since it has enough space for two and a weight capacity of 275lbs. 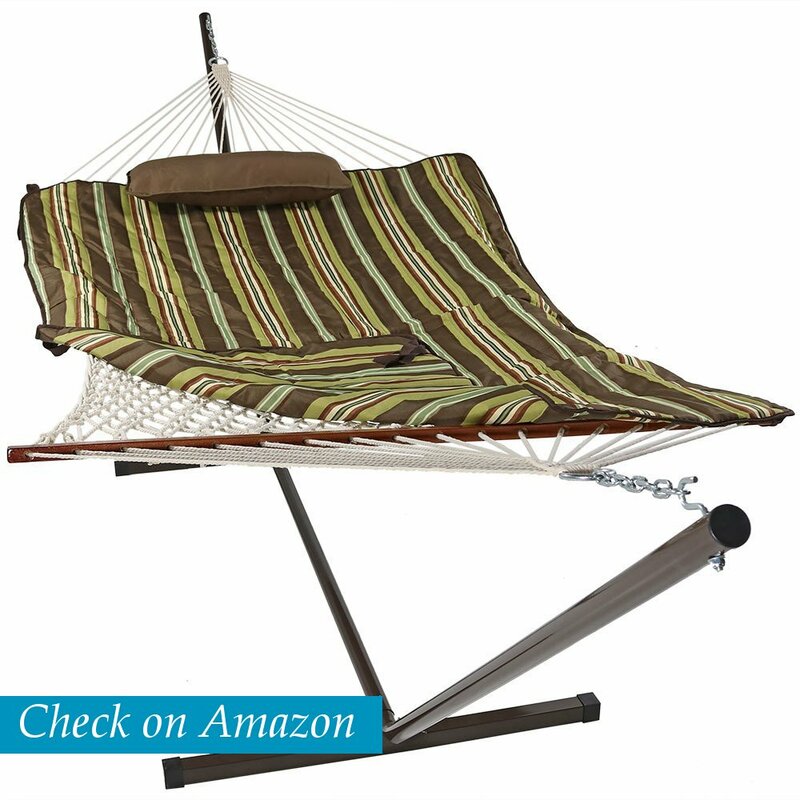 Cotton hammock rope, pillow and polyester sleeping pad plus 12-foot steel stand. Adding this to the idea that it is weather and rust resistant, you are sure that comfort will not be compromised under whatever condition. You don’t need extra manpower to get your hammock ready, even without any tools at hand, your hammock stand can be readily assembled within five minutes even when you are alone. It does not require skills or experience to start enjoying its services. Long are going the days when you required getting a site with two stable trees for you to assemble your hammock. With Sunnydaze Universal Multi-Use Steel Hammock Stand, mounting and comfort are not dependent on anything else; this is to say wherever you are you can set it up and enjoy relaxing there. The Sunnydaze portable hammock stand is easy to fix, and all you need is just the right spot, no tools needed. For years, Sunnydaze décor has been manufacturing high-quality garden and home products. The primary goal is to ensure that you get a beautiful piece that will improve your interior or exterior décor. For this reason, they have traveled around the globe to find innovative ways of making their product sturdy. They have a bunch of talented and skilled designers who use the manufacturing process and material to make you relax and have a peacefulness life at home and make you valuable. They pride in providing customers with the unique selection of product with different colors to ensure that your theme matches with the accessories and items you buy at an affordable fee. What is the type of your hammock? Is it Brazilian hammock, spreader bar hammock, Mayan or Camping hammock? Whatever the type this is the favorite you will ever get on the market. 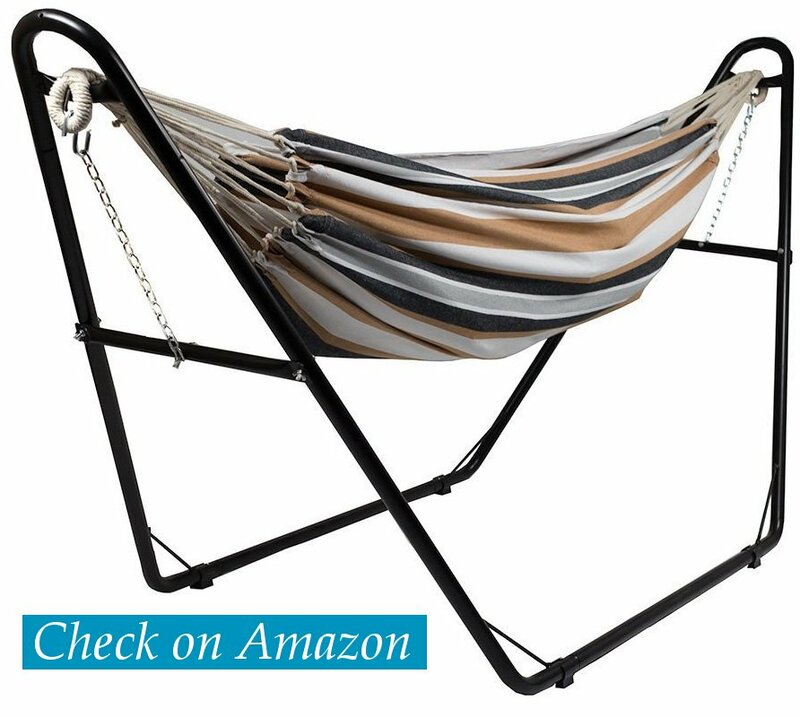 It has s-hooks and adjustable chains, which will ensure that the size of your favorite hammock fits perfectly to all sizes ranging from 9 feet to 14 feet long. When you are out camping, or you just want to relax after a hard day in the office, the last thing you want is to start engaging yourself in hard activities of assembling a hammock. This hammock stand is not complicated at all when fixing it; you will not face any challenge. In fact, you don’t require any tools to get it ready for you. However, you will assemble it manually and save time. Sunnydaze is a company whose focus is providing customers with quality items that will bring value to their money. When you buy this brand, you will be proud of the investment for years to come. The material used is the best quality with heavy gauge plated hardware, which ensures to hold a capacity of 440-pound weight and the tube frames are made of steel, which is rust-resistant, durable and lightweight when you have to move it. One thing you will love about hammock stands is their portability around your yard. If you think you need a little more sun on your skin, carry it to where the sun is. You can choose to have it facing east when the sun rises and west at sunset. Its portability allows you to stay out even when the sun is too hot. Hammock stand uniqueness and style also mean that it will be part of your home décor. You get to choose one that is perfect for your yard, and that will blend with the other pieces you have. You will not have to call big-bodied guys to help you hold it up and put it together. With the right instructions, installing it will not take more than a couple of minutes. Then you can enjoy being outside with your family and friends. The method and where you choose to hang your hammock make a huge difference. There are several things you have to consider when choosing a place to hang your hammock. One fact you will need to have is that hammocks require anywhere from 10 to 15 feet of stretching space. You will, therefore, need to ensure that the hammock you buy is not longer or shorter than the hammock stand you buy. You also need to ensure that you do have enough space for your hammock stand. If you do not have enough space for it, it is best to find other methods of hanging your hammock. Is the hammock for your whole family or just for one individual at a time? The size varies depending on how big you want it to be. Its strength and material will also depend upon how many people it will be supported at a time. You need a hammock that is light enough to be moved. If you are considering having it in many different places depending on the weather and what kind of view you want, you want one that is flexible and light. You also do not want a hammock stand that will dig into your yard and ruin your landscape. There are many materials used to make hammock stands. The most common are wood and metal. You will have to consider what type of material will be the best for you home. If you choose wood, you need to make sure that it is well treated to ensure that you do not face the issue of termites. If your wooden stand is not treated, being outside during the rain of having mist fall on it could cause wood decay, and termites may start eating at the wood. If you consider buying a metallic hammock stand, you also need to ensure that the stand is made from stainless steel. The last thing you want is for your hammock stand to begin rusting. Budget is a big one. How much are you willing to spend? Today, people are looking to save on costs. Even though you want to end up having the best hammock stand and still saving a couple of dollars, you need to remember that you cannot have your cake and eat it too. Some cheaper hammock stands are not the best in quality and will probably not last as long as you’d want them to. However, this is not to say all cheap hammocks stands are terrible. There are great companies that make great hammock stands at an affordable price. One thing you want to look at before buying a hammock stand is its reviews. You need to read the good and the bad, so you can make an informed choice when buying your hammock stand. If reviewers did not love the product, there are very high chances that you will not like them too.